Warangal Attractions: Warangal is a historic town earlier known as Orugallu in Warangal District of Andhra Pradesh. It was the glorious capital of the great Kakatiya rulers during 13th century A.D. Warangal city was the main centre of Telugu culture. Now it is tri-city including Warangal, Hanamkonda and Kazipet cities, and the second biggest city in Andhra Pradesh. Warangal District is bound on the northern part by the mighty River Godavari, with dense forests and picturesque lakes. - This ancient temple, located at Hanamkota, is a master piece of Kakatiya architecture. The triple shrined temple is dedicated to Shiva, Vishnu and Surya. It is famous for its architecture, and a great tourist attraction. is 12 kms away from Hanamkota. This beautiful fort is occupying a place of eminence. The outer wall has two entrances called Bandavi Darwaza and Hyderabad Darwaza. 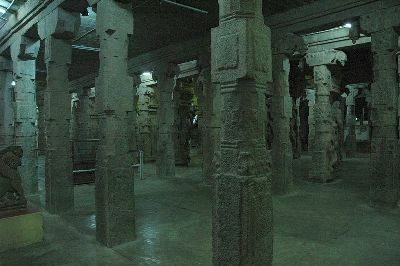 Inside the fort, there are some beautiful granite pillars, with superb sculpture. There are shrines dedicated to Narasimha, Padmakshi and Govindaraja. - Perched on a hill, Bhadra Kali Temple, built in Chalukyan sytle of architecture, is a prominent religious place. The presiding deity of Bhadra Kali is portrayed with eight arms, embracing a weapon in each hand. During the festive season of 'Navratri' and Kali Puja, large number of devotees visit here. - 2000 year old Jain temple with intricate carvings. and is 50 kms away. known for its scenic beauty. By Air:: The nearest Airport is Hyderabad, 155 kms away. By Road: Warangal is well connected by roads. Non-stop luxury buses operate from Hyderabad to Warangal.